From time to time we hear of children who are ambidextrous. This seems such an amazing thing – wow – imagine being able to write with both hands! But is it really a good thing and when, if at all, should we intervene? Before I dive in and get into this fascinating topic, I need to give credit where credit is due. A number of years ago I had the privilege of attending a series of courses on hand preference by the world renowned Dr Elke Kraus who has studied and devoted her life to this fascinating topic, even obtaining her PhD in hand preference. So, I had the privilege of learning from the master. Click through here to take a look at her website. In the early years, our children develop the ability to use both hands together, before a hand preference emerges. Some may choose one hand early on and stay with it, whereas others switch between the two for ongoing periods, leaving parents wondering whether their child is left or right handed. But, in time, it becomes clear and they show a clear preference either way. And then there are some who appear to never really know which hand is their preferred hand. This is frequently rooted in bilateral and midline crossing delays which are beyond the scope of this piece. These children have a mixed hand preference which, in lay person’s terms, is frequently called being ambidextrous. Ambidextrousness is, in fact, a very rare category of children and adults who can write equally well with both hands – and when I say equally well, I mean equally well. For the most part, the children who are presenting with mixed hand preference or mixed hand dominance, are really not proficient with either hand – their ability to reproduce things on paper is poor with both hands. So when do we, or should we, even worry about this? The literature says that hand preference can be established as late as 8 years old! For me that is very old to still not know which hand you are using. I have always believed that the Grade R year is the year of refinement when it comes to pencil control and, as such, I really like my Grade R’s to have established a preferred hand. 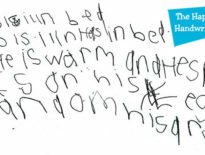 When they are still switching hands in Grade R and into Grade 1, there is little doubt in my mind that we are going to run into difficulties with the mastery of the handwriting process. Children need one specialised hand for developing handwriting, and an assisting or, as we call it, “helping hand” to stabilise the page. 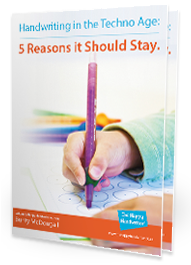 Without the ongoing repetition and practise that a preferred hand is going to get, the child is not going to be able to keep up with the demands of the handwriting process in Grade 1 and beyond. 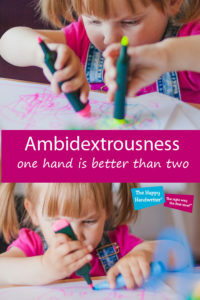 So, unless the child you are meeting is one of those rare individuals where they are truly ambidextrous and can truly use both hands with equal proficiency, a lack of hand preference development is, in my experience, something that we need to be looking into and addressing at least by the Grade R year. How do we Establish Hand Dominance or Hand Preference? What to do to assist an un-established hand preference is beyond the scope of this piece but here is one golden rule: never choose for the child! If you choose the wrong hand you can really muddle their wiring and cause all sorts of other problems. So the principle is to promote involvement in bilateral gross motor activities (using both sides of the body together) along with gross motor activities that involve crossing the midline. Construction and other manipulative play that requires the use of both hands is also important. Nuts and bolts are always a favourite for me! And then, when they are involved in refined single handed tasks, always place their tools in their midline and let them choose. This way you won’t be influencing the hand preference in either way. And then, I would call my friendly occupational therapist for some advice! 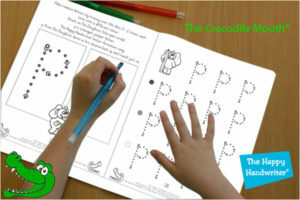 Good luck, and as a last word, the children you come across are not likely to be truly ambidextrous, for the most part, they have an un-established hand preference that needs to be developed to go onto master efficient and automatic handwriting.